The House of Training – ATTF has its roots set firmly in the history of Luxembourg’s financial sector. Beginning in the 1990s, when Eastern European countries started to gain their independence, the European Union asked for development assistance from all its member countries to facilitate this transition. Our political leaders were convinced that strong financial sectors would bring prosperity, sustained development and peace to these regions. Being well known as an international financial center, Luxembourg chose through its Ministry of Finance to provide technical assistance to these countries on a bi-lateral basis through the Luxembourg Institute for Training in Banking or “IFBL". Bankers from these countries were invited to attend seminars and receive technical assistance. The activity grew significantly over the years, to the point that the creation of a new entity became necessary to manage all this; the “Agence de Transfer de Technologie Financière” or “ATTF” was born. The ATTF was formally established in 1999 with the mission to be the partner of choice for the Luxembourg state, in the field of knowledge transfer from its economy to its selected list of emerging or developing countries. The developing countries in question where those looking to become part of the European Union, or countries with the lowest levels of economic development elsewhere in the world. Since its establishment, the ATTF has delivered more than 2,000 training seminars (of which approximately 330 took place in Luxembourg and the rest throughout the world) and has trained over 40,000 people. 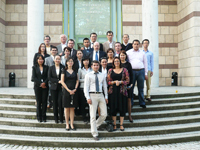 Many seminars have been organised together with the IFBL and its respected quality circles. The House of Training was formally established in 2015, bringing together under one single roof the "Luxembourg School for Commerce" (LSC), training institute of the Chamber of Commerce, and the "Institut de Formation Bancaire, Luxembourg" (IFBL), the training institute of the Luxembourg Bankers’ Association. On the 1st of January 2016, the ATTF was officially integrated into the House of Training. By joining the two prestigious institutions mentioned above under the single roof of the House of Training, the ATTF in fact joined forces with these institutions, by gaining new colleagues, new resources and the potential to extend its existing network. The activities and staff of the former ATTF were smoothly integrated into the House of Training. As a result of this integration, the House of Training continues today to master the complexity of delivering specific expertise and know-how, by delivering high standard trainings at international level.